New consumer research found that 68% of smartphone owners listen to streaming music every day. The study from Parks Associates revealed that smartphone owners spend more time with their tunes than any other form of mobile entertainment, clocking in at 45 minutes per day with streaming music. In comparison, 71% of smartphone owners said they watch video every day, but only spend 24 minutes on average doing so. Parks also broke out streaming rates by mobile carrier. 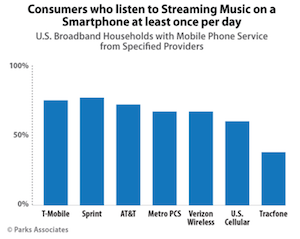 More than three-quarters of T-Mobile and Sprint respondents said they stream music daily. Both of those carriers have launched programs for improving the ease and technical demands of streaming, and the higher streaming rates imply that those efforts could be successfully attracting listeners. These are timely findings, released in the same week as the Infinite Dial 2016 from Edison Research and Triton Digital. The Infinite Dial presentation also highlighted the seismic impact smartphones have had on music listening habits. I would love to be able to stream at work but my data connection switches back and forth between 3G and 1X while I’m in my office, knocking my connection off. As an alternative, I load up my phone’s mp3 player with my iTunes purchases.